Jesus warned about those who have eyes but cannot see. His injunction resonates today when considering the general ignorance of the dangers of nuclear weapons, a risk of even greater consequence than climate change. Humankind is ‘asleep at the wheel’ on this, and our survival and the survival of the Earth hang in the balance. Can and will we wake up? Those serious enough to take a deep dive into the issue may be astonished by the thousands of groups and millions of individuals working hard to end nuclear proliferation and see the weapons done away with. The ways to get involved are legion, with sisters and brothers everywhere to work with you, if you know where to find them. For the big picture, ICAN (International Campaign to Abolish Nuclear Weapons) has posted a year-by-year summary of the history of the ‘nuclear age,’ starting with the first atomic weapon test in New Mexico, code-named Trinity, on July 10, 1945. A month later Japan was bombed twice, and six months later, the UN Assembly called for the elimination of all atomic weapons. That request notwithstanding, in the ensuing years we witness the USSR, UK, France, Israel, China, India, Pakistan, and North Korea arming themselves with nuclear weapons. Each of these countries is capable of ending the world as we know it and much if not all of humankind. In July 1955, a decade after the tragedy in Japan, a group of scientists including Albert Einstein, Linus Pauling, and Bertrand Russell published a Manifesto pointing to the terrible danger of nuclear weapons and the need to learn to settle conflicts peacefully. Since then we have a long series of treaties, resolutions, and organized efforts opposing nuclear proliferation. Today the UN’s 2017 Treaty on the Prohibition of Nuclear Weapons (TPNW) is receiving considerable attention by anti-nuclear activists. Rather than summarizing more of the history, below is a survey of four important organizations doing much of the heavy lifting. The survey includes stories of several leaders who have been particularly important in creating these organizations. The four groups do different kinds of work, but they collaborate with each other and hundreds of like-minded groups. Together they offer the interfaith activist an assortment of historical information, the issues within the issue, ways to get involved, and links to others sharing this quest. Accordingly, the Project’s website, its resources, and a team of millennial supporters is maintaining a basic set of educational resources. Particularly noteworthy are the “Nuke 101” files that provide an excellent grounding course in the subject. You’ll also find a free online, Stanford-certified course, “The Threat of Nuclear Terrorism,” where you get to see and hear from many of the most important contributors addressing a complex set of problems related to terrorists securing uranium and secretly building bombs. “The gravest security threat of our time is the danger of a nuclear weapon being detonated in one of our cities,” Perry says. Go here for TIO’s survey of educational resources about opposing nuclear weapons, including Perry’s foundational material. The added fascination of the William J. Perry Project comes from the man himself, a mathematician whose genius transported him into realms of power and influence and some hair-raising experiences. Today he is bent on educating the world about the dangers of nuclear weapons and doing something about it. For more of the story, read Perry’s My Journey at the Nuclear Brink (2015). It details how he became an anti-nuclear activist. Decades of experience and special access to top-secret knowledge of strategic nuclear options gave him a unique, and chilling, vantage point and, eventually, led him to conclude that nuclear weapons endanger our security rather than securing it. The book traces Perry’s thought process as he journeys from the Cuban Missile Crisis, to crafting a defense strategy in the Carter Administration offsetting the Soviets' numeric superiority in conventional forces, to presiding over the dismantling of more than 8,000 nuclear weapons during the Clinton Administration. Then comes of 2007 story of creating the Nuclear Security Project with George Shultz, Sam Nunn, and Henry Kissinger, to articulate their vision of a world free from nuclear weapons and to lay out the urgent steps needed to reduce nuclear dangers. The heartbeat of GSI is its president, Jonathan Granoff, the most active anti-nuclear activist on the planet. In his GSI bio we learn that “Mr. Granoff is an attorney, author, and international advocate emphasizing the legal and ethical dimensions of human development and security, with a specific focus on advancing the rule of law to address international security and the threats posed by nuclear weapons. He serves on numerous governing and advisory boards including Lawyers Committee on Nuclear Policy, Fortune Forum, Jane Goodall Institute, the NGO Committee on Disarmament, Peace and Security, Parliamentarians for Nuclear Nonproliferation and Disarmament, and Middle Powers Initiative.” The credits go on, including being nominated for the 2014 Nobel Peace prize. Granoff is a deeply spiritual man and in conversation repeatedly pivots to the moral and ethical imperatives embedded in the world’s religions that argue against nuclear armament. He is as patiently passionate and articulate with high schoolers as with prime ministers and presidents. Schedule allowing, he’s happy to meet with both. His special expertise concerns the evolution of public policy, overcoming the practical difficulties in succeeding legislatively, all the while promoting the cause in the context of treaties and legal complexities. The Bipartisan Security Group is dedicated to providing reliable information and analysis of global security issues to Members of Congress and their staff, with an emphasis on arms control, non-proliferation, and disarmament. The Middle Powers Initiative targets heads of state, diplomats, and other officials, primarily in “middle power” countries, defined as politically and economically significant countries that have renounced nuclear arms. The Middle Powers serve as a bridge to influence nuclear armed countries to keep treaty promises and reduce nuclear dangers. Middle Powers governments include Brazil, Egypt, Ireland, Mexico, New Zealand, South Africa, and Sweden. GSI’s team extends from Mikhail Gorbachev to Jane Goodall, from Nobel Peace Laureate Oscar Arias to Canada’s former prime minister, Kim Campbell. Some have been leading anti-nuclear pioneers, such as Ambassador Thomas Graham Jr., a former senior US diplomat who served six presidents. Graham was involved in negotiating every international arms control and non-proliferation agreement from 1970 to 1997, including the Strategic Arms Limitation Talks (SALT Treaties), the Strategic Arms Reduction Treaties (START Treaties), the Anti-ballistic missile (ABM) Treaty, Intermediate-Range Nuclear Forces Treaty (INF) Treaty, Treaty on the Non-Proliferation of Nuclear Weapons Treaty (NPT), Treaty on Conventional Armed Forces in Europe (CFE) Treaty, and the Comprehensive Nuclear-Test-Ban Treaty (CTBT). Another major player is Ambassador James E. Goodby. He served in the US Foreign Service, achieving the rank of Career Minister, and was appointed to five ambassadorial-rank positions by Presidents Carter, Reagan, and Clinton. As a diplomat he was involved as a negotiator or policy adviser in the creation of the International Atomic Energy Agency, the negotiation of the limited nuclear test ban treaty, START, the Conference on Disarmament in Europe, and cooperative threat reduction (the Nunn-Lugar program). He served as the head of safe and secure dismantlement negotiations for the development of methods for US and Russian verification of warhead dismantlement and the means of making the process irreversible. In brief, Ambassador Goodby has made the world safer for you and me. Abolition 2000, founded in 1995, is a network of more than 2,000 organizations around the world working toward the elimination of nuclear weapons. Many of these organizations are themselves extensive networks of individuals and groups addressing their own particular issues and mobilizing forces in their own way while sharing a common goal. Some are large and well-known, like the World Summit of Nobel Peace Laureates, International Physicians for the Prevention of Nuclear War, and the International Peace Bureau. Others have long been working in their particular fields of expertise, such as the International Association of Lawyers Against Nuclear Arms or Physicians for Social Responsibility. The network provides a forum for the exchange of information and development of joint initiatives and campaigns. It meets once a year and communicates via a number of list servers and through conferences, teleconferencing, and mailings. Membership is open to all who endorse Abolition 2000’s Founding Statement. Ensuring the participation of civil society in the process of nuclear disarmament. Abolition 2000 also includes affiliated networks and campaigns such as the Global Network Against Nuclear Weapons and Power in Space; Mayors for Peace; Parliamentarians for Nuclear Non-proliferation and Disarmament; Peace and Planet; and World Beyond War. The Interfaith Working Group brings different religious and spiritual communities together to highlight the immorality of nuclear weapons and the responsibility of faith-based communities to work for peace, cooperative security, and a nuclear-weapon-free world. It organizes interfaith vigils, presentations and programs at the UN. The workgroup inspired the 2018 Parliament of the World’s Religions in Toronto an historic declaration titled, “Responding to the Unique Challenge of Nuclear Weapons: A Passionate Call From The Parliament of the World’s Religions.” You can find the text here, written by Jonathan Granoff, in this issue of TIO. To be fair, numerous other parallel, collaborative organizations contribute to the effort. Other major players include Global Zero, religious groups like Soka Gakkai International and Pax Christi, and UN-affiliated organizations, like Unfold Zero and the NGO Committee on Disarmament, Peace, and Security. ICAN is a coalition of non-governmental organizations in 103 countries promoting adherence to and implementation of the United Nations Treaty on the Prohibition of Nuclear Weapons (TPNW). This historic agreement, adopted on July 7, 2017 with the backing of 122 nations, offers a powerful, much-needed alternative to a world in which threats of mass destruction are allowed to prevail and, indeed, are escalating. 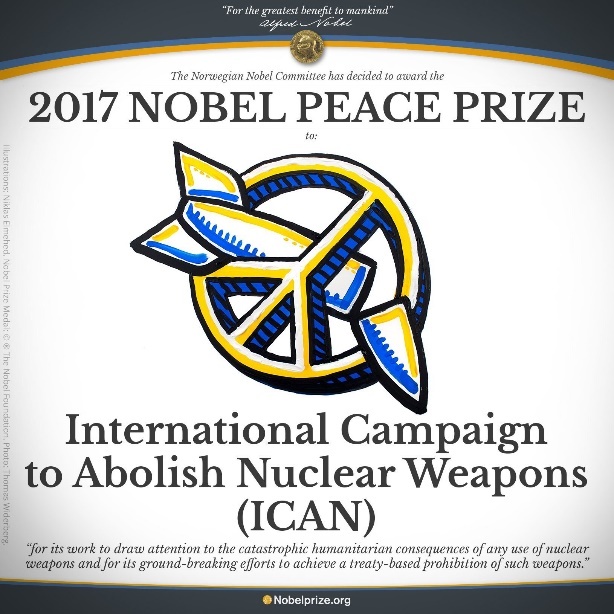 Later that year ICAN was awarded the 2017 Nobel Peace Prize for its effort in creating and passing the Treaty. Prior to the treaty’s adoption, nuclear weapons were the only weapons of mass destruction not subject to a comprehensive ban, despite their catastrophic, widespread, and persistent humanitarian and environmental consequences. The new agreement fills a significant gap in international law. It prohibits nations from developing, testing, producing, manufacturing, transferring, possessing, stockpiling, using or threatening to use nuclear weapons, or allowing nuclear weapons to be stationed on their territory. It also prohibits them from assisting, encouraging, or inducing anyone to engage in any of these activities. TPNW is not a done deal, however. Fifty nations have to sign and ratify the treaty before it goes into force. And that is what ICAN is all about. Their website offers the full text of the Treaty, where the Campaign stands in the effort to fully ratify the document, and ongoing related news. Will it end the nuclear threat? No. Will it take us the next important step in summoning humanity’s will to defeat the nuclear threat and survive. Absolutely. ICAN’s campaign is global. Its Partner Organizations agree to promote ICAN’s objective of the Entry-into-force of TPNW and to identify publicly with ICAN. They also are asked to keep ICAN staff informed of their plans and activities in support of the campaign’s objective, and to operate non-violently. In turn they are free to collaborate with other partners, use ICAN campaign materials, and receive strategic support. Individuals who want to participate themselves are given ample ways to get involved. The William J. Perry Project, the Global Security Institute, Abolition 2000, and the International Campaign to Abolish Nuclear Weapons – just four of the thousands of networked organizations that would welcome your involvement. Together they are challenging the impossibility of putting the toothpaste back in the tube and ridding ourselves of nuclear weapons pointed at humankind. Impossible? Millions of us passionately demure and are doing something about it. In short, you may feel you’re the only one in your neighborhood who knows enough to fear a nuclear holocaust and resist it. But you are being urged on by an army of anti-nuclear activists, buttressed by the values and activities of most of the world’s religions. We have no guarantees about achieving the nuclear peace we’ve longed for since Hiroshima and Nagasaki. But when millions of activists become billions, when you and I become more engaged, peace actually becomes more plausible.